The Berlin Wall’s construction 50 years ago must be a constant reminder to citizens today to stand up for freedom and democracy, the city’s mayor said Saturday as a united Germany commemorated the bitter anniversary. Seeing Berlin divided by the wall tore apart the country as well as separating the city’s streets, neighbors and families, mayor Klaus Wowereit said at a televised ceremony. “It is our shared responsibility to keep the memory alive and to pass it on to the coming generations as a reminder to stand up for freedom and democracy to ensure that such injustice may never happen again” – Wowereit said. German Chancellor Angela Merkel (who grew up behind the wall in Germany’s communist eastern part) also attended the commemoration in Berlin, where parts of the wall and an attached surveillance tower now form a museum. The road where the museum is located was divided in two on August 13, 1961, and some 2,000 east German residents were expelled from their houses to allow the communist authorities to secure the new border. The country was then divided for 28 years. Hundreds of east Germans were arrested while trying to flee to democratic Western Germany and at least 136 were killed trying to cross the wall. Germany had been divided into capitalist western and communist eastern sectors after the end of World War II. At the height of tensions between the United States and the Soviet Union, the East German regime started building the wall through the capital. National flags flying at half-mast Saturday are reminding Germans of a tragic page in German history – 50 years ago the Berlin Wall began to be built to separate the German Democratic Republic and West Berlin for 28 years. Russian news agency (Itar-Tass) reported that on the occasion of the anniversary, Germany will be holding a series of memorable events. During the night, at the Chapel of Reconciliation at the Berlin Wall memorial the biographies will be read out of the Germans who died while trying to cross to the West. At least 136 people attempting to escape to the West were shot by GDR border guards, or jumped out of high windows. About 200 Germans then were injured, and more than three thousand were arrested. The central events will be attended by President Christian Wolf, Chancellor Angela Merkel, Berlin’s Governing Mayor Klaus Wowereit and other prominent politicians of the country, as well as foreign guests. 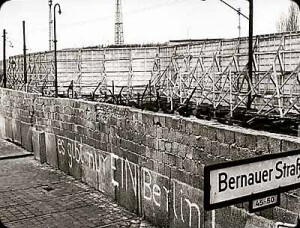 On the occasion of the anniversary in Berlin’s Bernauer Strasse, the site of the Archive Centre of the Berlin Wall, will have a second section of the exhibition of the history of the wall. The Catholic and Protestant churches of Berlin and Brandenburg will hold commemorative ecumenical services, wreaths will be laid at the Berlin Wall memorials. At night the film called Divided City – Divided World will be shown on a giant screen in Bernauer Strasse. The Berlin Wall (which became a fortified line of the state border between East and West Berlin) was erected by the authorities at the proposal of the GDR leader Walter Ulbricht in August 1961 in connection with the ever-increasing flow of defectors from the GDR to the West. Because of the lack of a clear physical boundary between the zones of occupation generally well-educated young professionals fled to the West. After receiving free education in the GDR, they preferred to seek jobs in western Germany, where they could expect a much higher salary. Germany on Saturday commemorated the 50th anniversary of the construction of the Berlin Wall with a memorial service and a minute of silence in the capital in memory of those who died trying to flee to the West. German Chancellor Angela Merkel (who grew up in the East) President Christian Wulff and Berlin Mayor Klaus Wowereit attended a commemoration in the capital, followed by a church service at a chapel built where the Wall stood for 28 years. Flags flew at half mast on the parliament and church bells tolled at noon as Germans were called to observe a minute of silence in remembrance of the 136 people who are known to have died in Berlin between 1961 and 1989 while trying to cross the border. Historians say this number may have been as high at 700. “No one knows the true figure” – Wulff said during the commemoration in Berlin’s Bernauer Strasse, the scene of many escape attempts. The place today houses a memorial visited by half a million people every year. “We bow our heads in remembrance of all who died at the Wall and of the hundreds who died on the inner German border” – Wulff said. “The dead and wounded, the hundreds of thousands who were emprisoned and politically harassed, aren’t the only victims of this Wall. “Millions were also forced to renounce the lives they wanted to live” – he added. At noon, Berlin’s buses and trains stopped for three minutes while local radio stations interrupted their programs. The commemorations began overnight with a more than seven-hour-long reading of the names and stories about the lives of those killed seeking freedom. This entry was posted on Saturday, August 13th, 2011 at 7:40 am	and is filed under Politics. You can follow any responses to this entry through the RSS 2.0 feed. Both comments and pings are currently closed.